A majestic 300-year-old cottonwood tree greets visitors crossing the Granite Creek Bridge entrance into Prescott Mile High Middle School in Prescott, Arizona. This great tree symbolizes growth, tradition, and adaptation. In 1867, a small log cabin, the first school in Arizona, was built in the shade of this great cottonwood. Thus began the tradition of excellence and service to the community as the school evolved from Prescott High School to Prescott Mile High Middle School. 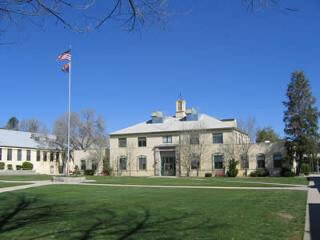 The original three buildings were constructed of solid, enduring materials as part of President Roosevelt’s WPA projects in the early thirties and dedicated in 1939 as Prescott High School. The longstanding buildings and additions feature amenities such as the football field and track, two gyms, two computer labs, science labs, library, and auditorium, which have served our educational needs well.